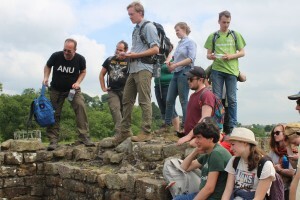 ANU students, American volunteers and UCLan students make up the bulk of our archaeologists. 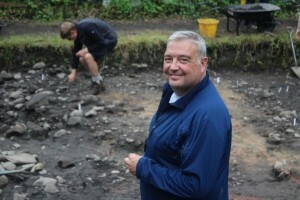 Here at Ribchester Revisited, we love people from all walks of life to truly experience coming here what it is like to be an archaeologist at its core. Whether it is students from UCLan (University of Central Lancashire), ANU (Australian National University), or volunteers from the United States through the Institute of Field Research, Ribchester Revisited has been fortunate enough to have all these fantastic people contributing to our project with their own unique skills and personalities. But it’s not only grown men & women and young adults we aim to bring here, as this project has a strong history of hosting pre-university age student who gain invaluable experience and memories by taking part in an archaeological project with others with similar ages and interests. This includes the Young Archaeologists’ Club (YAC), an organisation which seeks to get children with a passion for archaeology involved in projects and events that can fan the flame of their interest in archaeology. 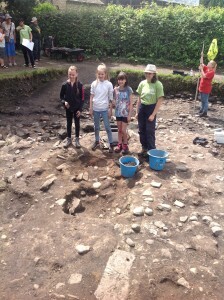 Former Young Archaeologist, Cassie Bradshaw, was the fortunate winner of a YAC competition in 2015 that enabled her to go to Ribchester for the day in order to take part in what we do here. Cassie so greatly enjoyed her time here that she entered the competition again next year and won again! Cassie (R) and ANU student Claire excavating their context. Our elite workforce comprised of the Young Archaeologists and their fathers! A: My name is Cassie Bradshaw. I’m 17 and I’m a student at Formby High Sixth Form. I’m studying Ancient History, Chemistry, Geography. A: I’m here because I have always had a great interest in archaeology and history since I was 5. This is how I was able to win the Young Archaeologist competition in 2015, when I first came to Ribchester. I enjoyed it so much, I’m here now as a Muddy Starter to take part in the archaeological process and to improve my skills in the field. Q: How are you enjoying Ribchester Revisited? Cassie (R) with the 3 Young Archaeologists taking part in this year’s Ribchester Revisited. A: I think it’s an amazing experience for anyone interested in archaeology or the Romans. 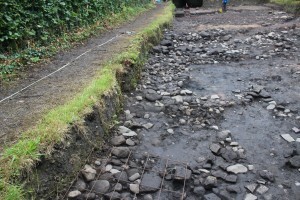 Since being here I’ve learned a number of techniques and skills that are vital for archaeologists, such as planning, coordination with others, and paying attention to important details within tasks. I’ve also greatly enjoyed the social experience here at Ribchester Revisited, as I’ve met so many amazing people with similar interests as me. Q: Do you think being here is beneficial to your future career prospects? A: Absolutely. Because it gives me a massive insight into how studying archaeology at university is also about fieldwork, not just lectures. 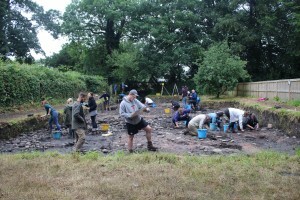 Not every university provides its students with an opportunity to take part in fieldwork that will be incredibly important for any future career in archaeology. This is why I’ve chosen University of Central Lancashire as my first choice for university. Q: To conclude, what would you say to other young people who are interested in archaeology or in taking part in Ribchester Revisited? 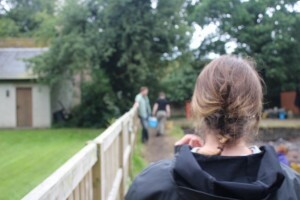 Cassie enjoyed being apart of this fantastic project with dozens of other like-minded enthusiastic students. A: I would say to go for it. It’s such a fantastic opportunity for people like us as it gives a massive amount of insight and experience into the archaeological process not just through fieldwork, but also through the social side and meeting other students. All three times, I was nervous before coming here but every time I was easily able to get along with others who shared my passion for everything that was happening here. Cassie used her experience as a Young Archaeologist to help the newest generation of YAC members to become capable members of our trench. We can only hope they’ll follow in Cassie’s footsteps and be with us again very soon! 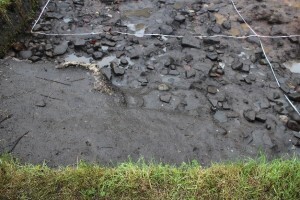 A Fork in the Road: A reflection on the Roman road surface within Ribchester. At the end of excavation last year, the road surface was left with some cobbles and just the slight hint of its sandy foundation showing. The sand may have gone completely unnoticed until this year if it hadn’t appeared in the edges of a previous trench that ran diagonally through it. With new revelations coming to light and a stronger focus on the road this year, more information is allowing us to rebuild the story of the road as it would have once been. 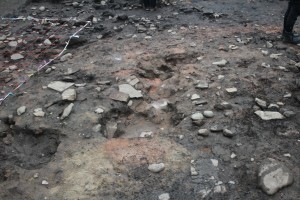 The road as it was at the end of the last excavation. Last year the discovery of hairpins and dress pins on the road had the archaeology team excited. What seems like simple pieces of metal common in our daily lives come with strong implications archaeologically. 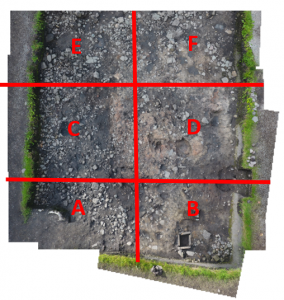 The evidence points to female activity within the walls of the Roman fort, which would have been highly unorthodox. Currently it is believed to be one of two explanations. The first of these being that the evidence is simply from females passing through the fort from the vicus, a nearby civilian settlement that would have provided for and traded with the fort. Alternatively, it could potentially be that in the later days of the Roman reign discipline became lax. This could have possibly resulted in the Roman soldiers situated there to have wives living near the fort. Since we are looking at Ribchester in its later days, the lack of discipline could indeed be possible. The sand layer that once lay beneath the road running across our trench. 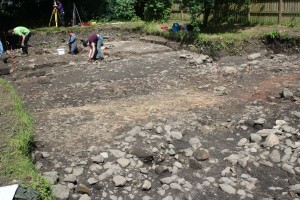 The pit discovered south of the road, half excavated and ready for a section. searching for Roman architecture. Up until recently it seems that the road surface was barely touched in comparison to the northern extent of our trench, but recent excavation has unveiled another trench and a pit just south of the road surface. However, these could simply be robber ditches left behind when someone excavated with the intent of stealing the stones from the road. From one of these newly discovered trenches we made the exciting discovery of the first silver coin found during this year’s excavation. The likelihood is that the coin was lost roadside and managed to find its way into the backfill of a trench. In relation to the rest of the coins found down in the southern area, it can be assumed that this one was lost by someone travelling as opposed to being discarded during a clean of the workshop. Roman coins for comparison excavated from last year. One of the repeat instances within the road this year is the discovery of lots of hobnails (nails that were used in Roman shoes). These have either been discovered on the roadside in what would have been a drainage ditch or within the layers of the road itself. Impressively two clusters were discovered with a high concentration of these nails together, one on the south-eastern side of the sand layer, and another to the north-west containing approximately forty hobnails. However, there was no leather to be seen despite finding such a high number of hobnails. This could potentially mean that the hobnails were accumulated over time washing down the side of the road. Alternatively, if it was a whole shoe it is possible that over time the leather would have degraded to a point where it was no longer salvageable. Together with the coin, this evidence could be indicative of the road being used often and not just acting as an intermediary path between the workshop in the South and a Northern building. 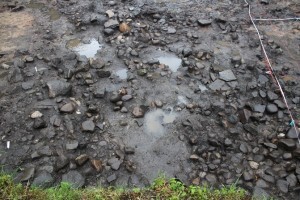 This about summarises what has been developing in the road thus far during excavation this year. But with more of our plans being signed off every day and ongoing excavations still underway, more and more shall be discovered. By the end of the month we will probably have a completely different image built up compared to what we currently have! More plans of the road, not too long until a complete excavation is underway. A section plan being worked on for the pit discovered. 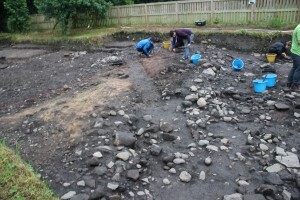 Digging in Roman Ribchester has unveiled a mass of new information on how the Roman fort not only formed, but thrived. After 2 years of excavations in the Vicarage of Ribchester, we have finally come upon evidence for the decline of the fort (around the 3rd-4th century). 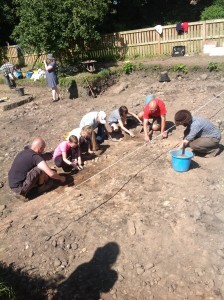 This year’s excavation, though complex, is showing signs of Roman life! Last week we focused our post on the north end of the trench, stretching our explanation to the road found in the centre. This week we will talk you through the south of the trench, giving you an in-depth tour through the eyes of the archaeologist. 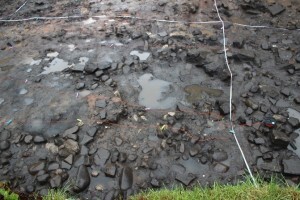 When excavating, archaeologists use a grid system to divide and organise their trenches. These grid squares all have their own letter to help differentiate them. For our trench, our grid squares are 5x5m. You can see how our trench is divided in the picture below. Grid square systems in the south of the trench, Grids A to F.
Mainly covered by our access ramp, Grid A shows the first signs of the elusive Northern road through the fort. 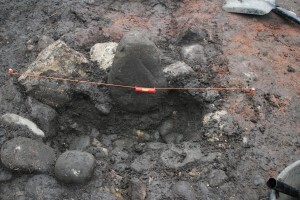 We have also discovered the foundations for a building layer, showing a possible structure. Currently we are removing the demolition layer, formed after the building was abandoned. Further work on this area will happen in the coming week, with section supervisor Jess hoping to unearth the true extent of the structure within this grid. Grid C continues the building shown in Grid A, with the appearance of a black central layer which indicates that burning occurred within the area. This, combined with the recent discovery of an orange coloured hearth, suggests that the building was used as a workshop. This could be significant as it is placed next to the Northern road, suggesting commercial activity within the fort. In the southeast section of the trench (Grid B & D) we have uncovered a large yellow-orange clay floor surface with evidence of burning. Supporting this, is a deep flue feature (discovered last year) which would have been used for the manufacture of artefacts. This is an exciting find, because it shows that this space within the military fort has morphed from an area that we assume was purely used for ‘defence’, to a manufacturing workshop. A soil analysis completed at the end of last year’s excavation has indicated levels of silver, gold and mercury in the soil. 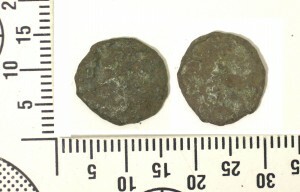 This suggests that perhaps those living and using the fort in the 3rd-4th century were making coins or objects for trade. Currently, our hypothesis is that the area was consistently used and reused for a number of activities throughout its occupation including, metalworking, glass working and possibly even tanning! This year, we are taking ICPMS (Inductively Coupled Plasma Mass Spectrometry) samples from each grid square in order to better understand how this space was used throughout Roman occupation. So, in the south of the trench we have many exciting things happening! Of main importance, is the continued use and reuse of the same area for different purposes. We are excited to see how this story continues to unfold over the course of the next three weeks. Stay tuned for more updates, and visit us on site! The team consisting of University of Central Lancashire (UCLan), Australian National University (ANU) and a selection of students from the USA, as well as local volunteers. The site is open to the public for tours Tuesday to Sunday from 11 am to 5:30 pm. Over the last 5 days we have been hard at work in the trench. A lot has changed and progressed since our previous blog in 2016. So to bring everyone up to speed we are going to tell you some of the exciting discoveries we have made during the first week of the 2017 excavation. We have the far north section extending outside of the main trench edge, constrained by the fence of the vicarage. It is here that we are hunting for the boundary ditches of the fort. The inner north section of the trench contains the fascinating outline of the guardhouse and a foundation of the wall-support to the right, the guard house has lots of layers (known archaeologically as contexts) and is going to be really exciting to excavate over the coming weeks. A distinctive bright orange band of sand, that is the foundation of a road, dissects the main north road to supply an inner road (intervallum) for the following buildings. Here, we have found a large amount of coins and other exciting finds. 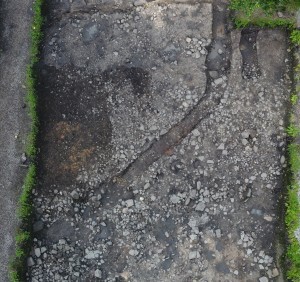 The roman road visible in the trench. Last but not least, the South end of the trench contains indications of a flue, a small passage for air made to feed more oxygen to a fire. This, followed by our geophysics results which show trace elements of mercury, gold and silver, is indicative of a possible workshop space. 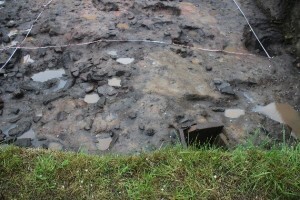 The southern part of the trench including the clay floor and flue. The core aims of Ribchester Revisited 2017 are to gain more insight into the ‘guard house’. We are hoping to find out exactly what activities were carried out in the building, as there is evidence of frequent activity in this building from observing the external stratigraphy. Additionally, we will be looking into the use of the workshop and hopefully making some more in depth interpretations about what was produced there. This should give us further clues into the community that inhabited this ancient town. So we hope to uncover some exciting information about these two features. 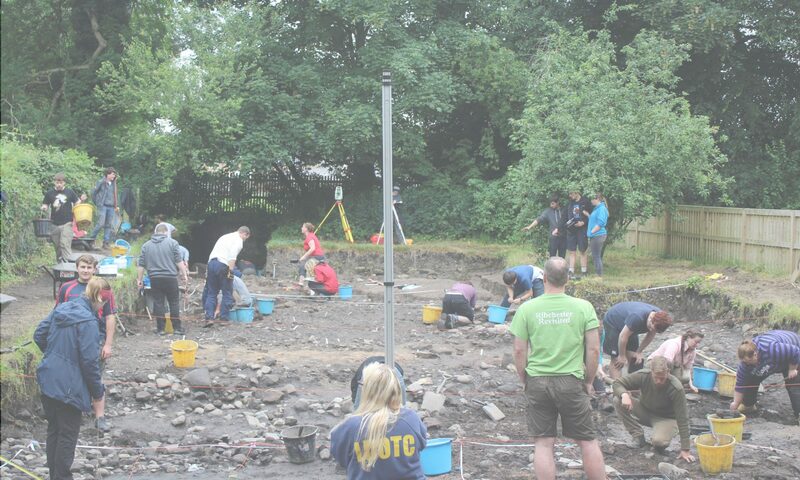 In more recent news the dig team , comprising of students from the University of Central Lancashire (UCLan), the Australian National University (ANU) as well as a contingent of students from various American universities have been working over the last 5 days to great effect. We have uncovered part of the northern road. The northern road emerging from the side of the trench. this would have been one of the main thoroughfares of the fort as it extends to the far north section of the trench. Following the road to the south-end of the trench, discoveries have been made regarding what was once thought to be wooden wall. Trowelling back has now been shown to indicate the existence of a stone wall. There comes a time in every project’s life when it gets its own website, Ribchester Revisited has now reached such a moment. This website will grow and change as the project does. 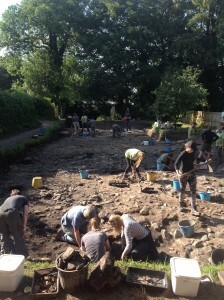 Although in development for a number of years, Ribchester Revisited really started in 2015, with the first summer of month long excavations. 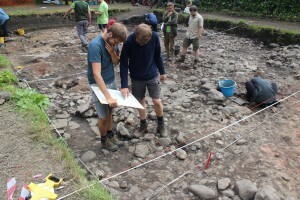 Previously UCLan students had been undertaking small scale digs and projects preparing the ground. 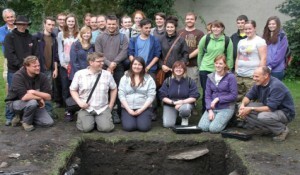 This started in September 2013 when first year archaeology students excavated a small test trench. Further test trenches in 2014 led to the opening of our main trench in 2015. Those test trenches no longer exist, our excavations now cover the areas they once occupied, but they served a vital function, allowing us to gain an understanding of the depth and survival of the archaeology. We will now use this website to update everyone on how the project progresses. Expect periods of activity, especially in the summer when students will be blogging about the excavations, with periods of calm as we return to teaching and the slow task of post-excavation and research.